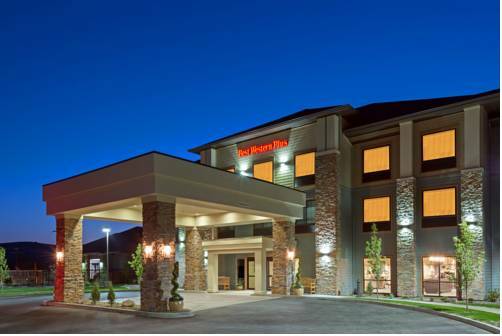 Nestled along the rolling Palouse Hills in the charming town of Dayton, Washington is the Best Western Plus Dayton Hotel & Suites. This is wine country, where relaxation and getting away from it all meets luxury. Guests of our Dayton hotel can enjoy an abundance of local activities. For a touch of history, visit the historic Lewis and Clark Trail, Dayton Train Depot and local courthouse built in 1887. Palouse Falls and Umatilla National Forest are also in the region and popular spots for hiking and birding. Whether you're in Dayton for wine tastings, the great outdoors or for a peaceful escape, depend on us to be your home away from home. Along Highway 12, history is rich in this area. Hunting and fishing have long been two of the pastimes of choice, and it's easy with ample forests and parks surrounding this Dayton hotel. However, with over 175 wineries in the area, guests can also enjoy the fruits of this lush landscape. From world class dining to the Columbia County Fair, there's something for everyone. Ski Bluewood is a favorite ski resort nestled a short drive from our spacious, clean and comfortable Dayton hotel. All Wheels Weekend is a car show that attracts guests from around the country. Mule Mania and the local Alumni Weekend are also events that draw a crowd. If you're in town for a special event, it's important that you are close to all the action. Our Dayton hotel features well-appointed rooms and a great location, so it's simple to get around town. Business travelers are also frequent guests at our Dayton hotel. We're happy to host employees of the Forest Service, Pacificorp and Puget Sound Energy, and many agriculture workers in the wheat and grass industry and Seneca. Enjoy a complimentary breakfast featuring hot waffles, pastries, fruits and 100% Arabica coffee. Whether you're traveling for business or pleasure, it's important to kick off the morning in style. Book your room at the Best Western Plus Dayton Hotel & Suites today! 30.00 mile(s) from Bacon & Eggs, bar/lounge, American, open for: breakfast, lunch, Great offerings for breakfast and lunch in a cozy cafe atmosphere. Enjoy a breakfast cocktail or coffee and dishes made with locally grown ingredients. 9.00 mile(s) from Whiskey Creek Bar, bar/lounge, American, open for: breakfast, lunch, dinner, Offering a sports bar with great food in a family friendly environment. Outdoor seating also available. 9.00 mile(s) from Gleason's Galley, cafe, American, open for: breakfast, lunch, dinner, Offering pastries biscuits & gravy in the morning and sandwiches for lunch. The dinner menu changes daily offering meatballs, chicken dishes and other tasty treats. 0.10 mile(s) from Manila Bay Cafe, cafe, International, open for: lunch, dinner, Offers eclectic cuisine with outstanding flavors and a beautiful presentation. Intimate dining in a friendly atmosphere. 30.00 mile(s) from Jacobi's, bar/lounge, Italian, open for: lunch, dinner, Casual excellence with homemade soups, salads & sandwiches. Italian pasta dishes as well as baby back ribs, chicken, steaks & seafood are offered. 9.00 mile(s) from Whoopemup Hollow Cafe, cafe, Cajun, open for: lunch, dinner, Enjoy Southern Comfort food in a comfortable, friendly environment featuring local and regional wines, domestic and imported beers. Reservations strongly recommended. 30.00 mile(s) from Andrae's Kitchen, fast food, American, open for: lunch, dinner, Walla Walla's first gourmet food truck! Available for catering all size of events, visit them at AK's at the Co-Op walk-in or drive thru. 0.20 mile(s) from Chief Spring's Pizza, bar/lounge, American, open for: lunch, dinner, Incredible pizza and breadsticks as well as salad bar, sandwiches and other options available. 30.00 mile(s) from Big Cheese Pizza, fast food, American, open for: lunch, dinner, Great pizzas, calzones, salads and desserts. 2.00 mile(s) from LC @ The Green, deli, American, open for: breakfast, lunch, dinner, Enjoy lunch on the green of the Touchet Valley Golf Course. Terrific breakfast, hamburgers, sandwiches, steak and seafood. 1.00 mile(s) from Fiesta en Jalisco, bar/lounge, Mexican, open for: lunch, dinner, Offering authentic Mexican food. A wonderful, extremely diverse menu for lunch and dinner. Also, offering limited American food. 0.20 mile(s) from Dayton Eagle s, bar/lounge, American, open for: lunch, dinner, Offers dining in a casual atmosphere. Monday is taco night. Live music on most Friday and Saturday nights. 30.00 mile(s) from Graze, deli, American, open for: lunch, dinner, Your food will be fresh, honest, and very high quality. Our sandwich shop is where you will find the best sandwiches in town. 30.00 mile(s) from Aloha Sushi, bar/lounge, Japanese, open for: lunch, dinner, Offering appetizers, soups, salads, nigiri, teryiaki and over 30 unique sushi rolls. River - 5.00 mile(s) from Lewis & Clark Trail State Park, a 37 acre camping park with 1,333 feet of fresh water shoreline on the Touchet River. The park is a rare treasure of old growth forest and river in the midst of the surrounding arid grassland. Hunting - 30.00 mile(s) from Hunting, local wildfowl for hunting include turkey, pheasant, and grouse. Deer and elk hunting are also very popular in this area with an occasional moose wandering through the region. 0.10 mile(s) from Creative Designs, more than just a great hair salon. the store also offers handbags, jewelry, sunglasses, gently used clothing and much more! 30.00 mile(s) from Bicycle Barn, has 10,000 fun-filled square feet of bicycles and offers the best prices and service with American-made brands like TREK, Specialized Oakley, Redine BMX, WeThePeople BMX, and many others. 30.00 mile(s) from Main Street Furniture, offering new, custom and consignment furniture and accessories for your home. 0.10 mile(s) from St. Vincent de Paul Store, this thrift shop is well-maintained and houses many treasures with proceeds benefiting local residents in need. 0.20 mile(s) from Croft s Floral, has been a family owned floral gift shop since 1952. Offering fragrant flowers, balloons, gourmet chocolates, Jelly Belly candies, candles, fun hats and other great gifts. 0.20 mile(s) from Jacci s Yarn Basket, high quality wools, wool blends, alpaca, silk, cotton and acrylic yarns besides lot of specialty and sock yarns in a wide selection of colors. 30.00 mile(s) from Dusty's Ski & Rentals, strives to promote healthy outdoor lifestyles, be an outstanding community citizen and maintain a profitable business. Dusty's has been in business for almost 20 years! 0.20 mile(s) from Hometown Carpets & More, providing carpets, rugs and floor materials. 0.10 mile(s) from Dayton Historic Depot, the Depot Museum gift shop has great collectibles, gift items and books on local history. 30.00 mile(s) from L & G Ranch Supply, we are a retail True Value hardware store. 30.00 mile(s) from Klicker Berries & Antique, Klickers has top quality local produce, locally made food, and unusual gift items, including antiques. 9.00 mile(s) from Waitsburg Hardware & Mercantile, offers a wide variety of hardware including electrical, plumbing, painting, gardening, and fishing/hunting supplies. Gifts and collectibles also available. 9.00 mile(s) from Hugs, Gifts & Collectible, affordable home decor, antiques, collectibles, Heritage lace, Burt's Bees, Crabtree & Evelyn, and holistic pet food. 30.00 mile(s) from Walmart , they are a worldwide retail chain offering pharmacy, groceries, beer and wine (including local wines), tire and lube, domestics and more. 0.20 mile(s) from Gallery at the Weinhard, original artwork by talented local artists Jill Ingram and Monica Stobie. Commissioned pieces, prints and cards also available. 0.09 mile(s) from McGregors, has a full team of professionals to provide growers around Dayton and Starbuck with the products and equipment they need to successfully raise the wheat, alfalfa seed and peas that make this region thrive. 0.03 mile(s) from Dayton Title Company, a customer service driven company who understands the importance of your real estate transaction. 0.02 mile(s) from Puget Sound Energy, power company serving the surrounding areas. Wind Farm projects. 0.02 mile(s) from Columbia County Rural Lib, an accessible and valued resource, committed and responsive to the lifelong learning and recreational needs of the entire community. 2.00 mile(s) from Dayton Mercantile, IGA grocery store with a Subway Sub Shop located inside the store. 0.03 mile(s) from Blue Mountain Realtors, imagine the combined knowledge and expertise of Dayton s finest real estate minds working for you. Where Buyers and Sellers meet! 1.00 mile(s) from Chapman Heating/Air, provides services to heating and air conditioning. Sells and installs new units. 0.02 mile(s) from Sterling Savings Bank, provides personal and business banking in Washington, Idaho, Oregon and Montana. 0.01 mile(s) from Christy's Realty, realty and property management company. 2.00 mile(s) from Coleman Oil, offers quality cardlock fleet fueling services to commercial customers throughout the country! 3.00 mile(s) from Pacific Power, power company serving the surrounding area. 0.01 mile(s) from AmericanWest Bank, serves business owners as well as their employees and families those who put their heart and soul into their life s work and just happen to build a stronger America along the way. 1.00 mile(s) from Blue Mountain Counseling, a private non-profit outpatient behavioral health care program. 1.00 mile(s) from Dayton General Hospital, part of the Columbia County Health Care System. This is a local hospital for the surrounding area. 1.00 mile(s) from Banner Bank, is committed to being the best provider of financial services in the Northwest. 1.00 mile(s) from Dingle's of Dayton, a True Value Hardware Store and much more! 1.00 mile(s) from Dayton Dental Care, providing dental work to the community for over 20 years. 30.00 mile(s) from Columbia Pulp, a revolutionary pulp mill turning waste straw into pulp for papermaking, and processed byproducts for various uses. 33.00 mile(s) from Blue Mountain Community College, is a comprehensive community college committed to providing a premier learning environment and support for student success. 22.00 mile(s) from Walla Walla Community College, inspires students to discover their potential and to achieve their goals by providing diverse and challenging learning environment. 24.00 mile(s) from Whitman College, is the premier liberal arts college that combines academic excellence with an unpretentious Northwest culture and an engaging community. 27.00 mile(s) from Walla Walla University, a fully accredited university, which offers excellent graduate and undergraduate education in the Seventh-day Adventist tradition. 0.20 mile(s) from Palus Artifact Museum, offers a collection of locally found artifacts from the Palouse Indian tribe. 30.00 mile(s) from Fort Walla Walla Museum, step back in time. Visit Fort Walla Walla Museum and experience what life was like in Walla Walla during the 19th century. 30.00 mile(s) from Wineries/vineyards, over 170 wineries in the greater area of Walla Walla. 0.10 mile(s) from The Liberty Theater, is home to current movies, art shows, children s theater, and stage productions. 0.10 mile(s) from Dayton s Historic Depot, originally built in 1881 and designed in the Stick-Eastlake style, it is now the oldest surviving passenger train station in the state. 30.00 mile(s) from Birding, the diverse variety of 310 bird species results from the nearby Blue Mountains as well as the Columbia and Snake Rivers. Sixty-five-foot tall chain saw sculpture commemorates a 1988 high school football rematch -- played fifty years after the first game by the same participants. Chinese-built tunnels were conduits for illicit activities, gambling and prostitution. Actors perform a once-a-year reenactment of tunnel life.